Cold Stone Ice Cream Experience! Kate: The Cold Stone Creamery is an ice cream pallor that is completely different to anything you would have experienced before- I promise! The ice cream is incredibly yummy with a wide range of flavours to chose from, combined with a seemingly unlimited choice of mix ins. To top this all off your creations will be made freshly in front of you via an array of tricks you never thought possible, leaving you desperate for your next visit! 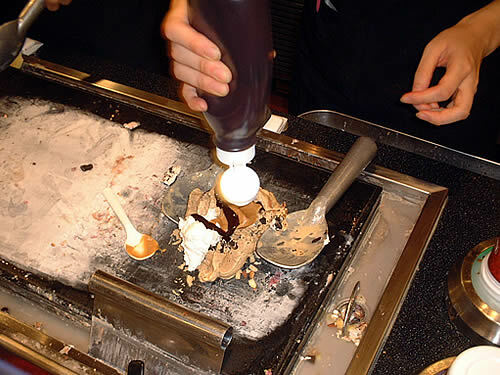 Cold Stone Creamy first opened in 1988 (America) and since then has been reinventing people's expectations in terms of their ice cream experience. So what is it that makes Cold Stones such a great experience? Firstly only premium ice cream and sorbet is served. The ice cream and sorbet served is made fresh in store, every day making the taste heavenly. The next reason is the mix-ins, which allows unprecedented choice. Guests can choose from Cold Stones popular signature creations developed by an award winning Tastemasters team, to creating their very own ultimate ice cream fantasy. When I visited the store I created my dream combination: A cake batter and cotton candy ice cream combination with rainbow gummy bears. To give you all an insight into how extensive the Cold Stone range is, according to their website you can customize your ice cream in over 11.5 million ways- wow! Finally every creation is mixed together on a cold clean granite worktop. During creation staff are chatty and friendly performing tricks with your ice cream ensuring that waiting for your creation is anything but boring! Chelsie and I visited the store numerous times and each experience was entertaining and different! Selection can vary depending on the store. Kate and Chelsie's Experience- Dubai, Emirates Mall. Chelsie: In May 2012, Kate and I visited Cold Stone Creamery for the very first time. The store is welcoming, with staff that simply could not do anymore for you! On my first visit I asked the man behind the counter for advice on what to select as the choice was so extensive. I was allowed to try numerous flavours in my quest to select the best combination, which was a delicious treat and a nice touch. My final selection was chocolate and French Vanilla ice cream with Oreo cookies, during my ice creams creation I actually stood back in owe. My ice cream was literally catapulted across the room and caught in its cup by another staff member- Amazing! My ice cream creation was flavoursome and fantastic, and as a result of this we returned several times throughout our holiday. Without doubt the most enjoyable part of the experience is discovering new and exciting combinations!